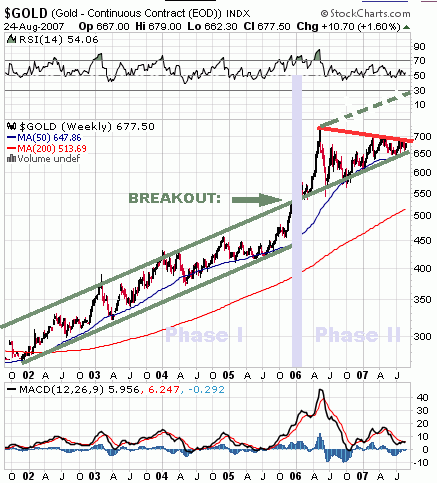 It has been about three months now, since our Gold Uptrend article was published. At that point, many were still fearful that the gold uptrend may have weakened because it had been in a consolidation patterns for almost a year and a half at that time. The article said "no such thing" in essence and predicted a major breakout to the upside. That's exactly what we got. The breakout came only days later, and the following rally hasn't stopped yet. In July, gold was at $660 to $670. Now, it's at $790 at the time of this writing. There is more to observe than just the pure price increase, though. As noted in August, we are now in Phase II of the gold bull market. The price broke out of its original up-channel in December '05 to January '06 and went into 'second gear' if you will. The upper trend line of the original channel now forms the lower trend line of the new channel. The breakout in August/September has confirmed the existence of the second-stage uptrend channel. The price is currently in the upper half of that channel presented by the thin broken green line that marks the mid-range of this channel. It is also noteworthy that, despite having had a nearly unbroken $130 run to the upside, gold has only barely re-entered overbought territory (seen in the RSI at the top of the chart). Not only that, it was deeper into overbought territory when it clawed its way up from $710 to about $750, than it is now that it stands at $790. In fact, gold spent almost the entire month of September in overbought territory and worked virtually all of that off in only one day of steep losses at the beginning of October. What's more, yesterday's one-day drop has again taken it back out of overbought status. All of this means there is still a lot of upside left in gold before it corrects again. That, of course, is no guarantee that it won't correct sooner rather than later, but given the time of year (bullish for gold) and the price of oil topping $90 (bullish for gold) and the continuing signals from the credit markets that all is not well with the fiat world (bullish for gold) and the dollar's continuing downhill run on the wintry slopes of fiat land (bullish for gold), the prospects look quite promising. I fully expect gold to reach $900 by the time the year is out, or soon thereafter. If I were trading gold, however, I would take about a third of it out in anticipation for a possible correction and use it to buy back in after it occurs. Better safe than sorry. (By the way, I do not trade gold, and I don't recommend it). Gold stocks are doing equally well, or even batter, actually. Both the HUI and the XAU are nowhere near overbought territory yet, despite a tremendous run over the last two months. In addition, the HUI just bounced off its "Super-Strong Support" in late August, support that dates all the way back to late 2004 when it began to form a ceiling that was not broken until two years later, at which time it turned into a floor that has held four times since then. The outbreak was predictable, predicted - and promptly occurred, while others were still fretting about the danger of a continued and prolonged sideways motion, or even a breakdown, of the HUI. Now, as can be seen in both the HUI and XAU charts above, the old high from 2006 very briefly looked like it was becoming a ceiling during late September early October, then shot up, corrected down, bounced off the old ceiling as a new floor, and rose from there past its first October high. We are in very comfortable territory, here. If you have some loose fiat change lying around doing nothing, it would be a good idea to turn it into real value and buy some physical gold and silver. There is nothing better. Silver is still not entirely out of the woods, although things are continuing to look better and better. It's just a little bit slow behind its golden cousin. In order to fully break out of its medium-term funk, silver needs to get past the $15 mark, which poses as the high from June of 2006. I have every confidence that it will do that, shortly. The $15 level also happens to be the point at which silver will re-enter its uptrend channel that dates back to September of 2005. Once it shoots past that point, there will be no holding back. Its recovery from that doomsday scenario was absolutely impressive, and it is one of the drivers (along with gold and gold shares' bullish posture) why I believe it will make it past the crucial $15 mark. If, for some reason though, silver should convincingly drop off away from there back to the downside, it will form a triple-top formation and that will become a major problem. This is merely a cautionary note, though. I cannot really envision a fundamental reason why silver should diverge so extremely from gold during a powerful gold-upswing. Why Did Silver Slouch Away? Silver's price is far more subject to industrial pressures than gold because it is so extensively used in so many processes. Exactly one year ago, on October 30, 2006, MarketWatch, which is usually more attuned to the precious metals markets than other mainstream financial news outlets, published an article by a commentator who was very bullish on silver and predicted the big move to $15 and beyond would happen that same fall and winter. Well, we have the luxury of hindsight and the ability to mildly shake our heads at his apparent folly. Yet, the reasons he cited for his prognostication all appeared sound at the time, so what happened? Tom Stundza at Purchasing.com published an article about silver's soaring price int he last quarter of 2006 while industrial demand from photographic and electronic applications was seen to be slipping and forecast to be slipping even further in 2007. GFMS is forecasting that demand will fall in 2007 under the impact of much slower growth in global industrial production and a less strong year for the electronics industry. Photographic use of silver is dropping by 11% this year and will fall again in 2007 as demand continues to be affected by the switch to digital technology. Also, the high silver price has prompted some economization in its use in photographic film production. No mystery here. That quote pretty much sums it up. Stundza expected rising investment demand to largely neutralize and even outweigh this drop in industrial demand - but I guess he was wrong on that point. Well, that's good for you. It means that now, a little less than one year later, you can still buy silver at $14 an ounce instead of $20. Silver's RSI and MACD look good. The RSI shows it is not yet in overbought territory even though it is getting very close to reentering the "green zone" in the chart above. There may be some consolidation between now and the time it passes that milestone, ut if it does by, say, the end of November, expect some fireworks to go off. On Friday, October 2007, the 20-year anniversary of the infamous 1987 crash, the Dow took a dive of a little over 360 points. Not really. The Dow has weathered far more serious setbacks and has always come out smelling like a rose. At least that’s what some would have you believe. It may have come out of that sudden drop smelling like a rose yet once more. The problem is that wilting roses - you know, those that have been around for too long - have that nasty funeral-parlor smell on them, and that is what this one is starting to smell like. On the technical side, reverse triangles or “megaphones” as they are often called usually announce a coming breakdown. In the latter half of 2007, the Dow has traced out a picture perfect example of one of those. Its declining lower flank hits the right edge of the chart at about 12,000. That is about the next downside target as indicated by this chart, which shows the steepening lower trend lines of this 27 year Dow bull-run. The third trend line from the bottom hits the right edge at right about that same level, indicating some support for the Dow. So, somewhere in that neighborhood it should turn in an intermediate bottom, but that is unlikely to last. Fundamentals, my dear Watson. Fundamentals. What has been fueling this most recent rocket-run of the Dow was money extracted by homeowners from their home equities and then spent and invested in the market place. Remember the baby boomers? Just a few days ago, I read somewhere, the first ever boomer went into retirement. Boomers were notoriously bad savers, and Greenspan made saving even more difficult for them by enticing massive mal-investment with his low interest rate policies, which resulted in discouraging all saving and diverted savings money into the 1999 stock bubble. Saving just isn’t much fun when you don’t get any returns worth bragging about. Its more fun to play the stock market where returns are just begging to be 'bagged. Well, as you may have heard, the housing boom is OVER - and so is the thus-generated equity cash machine. I have a very dear relative who has (wisely) bought a modest home for little money, watched it appreciate due to the boom, and then (unwisely) uncorked that intoxicating bottle, cashed out illusory equity, and poured it out over profligate spending habits. Predictably, it all resulted in a stinking mess. Now she can’t sell the house because she owes more than it will sell for, and her mortgage is two times higher than it was to begin with. Many Americans are in the same situation. Soon, they will be cashing out their stock investments which will send the Dow plummeting. What may be fueling a rebound from the initial drop to the 12000 level may be the most recent rate cut by the Fed and the market’s pricing-in of another one with a chance of oh, somewhere around 100 percent, dome analysts said. They were right. The second rate cut came - but it was accompanied by language from the Bernie-Oracle (should we call it the "Bernacle"?) which some interpreted as meaning there won't be any more rate cuts anytime soon - and the Dow promptly put in another 360-plus point drop. Rate cuts are - usually - great for the stock market, at least in the short term. But this time, all they will garner is further selling by foreigners of the US dollar. Those few companies who still produce stuff here in the US and export their products may benefit, too. Unfortunately, though, there isn’t much productive capacity left in the US to push the economy out of its doldrums as a result. That capacity is now in China, thanks to globalists like George Bush and those who groomed him. US Fed rate cuts won’t help exports all that much as a result. It's only that this time it will be far worse - because the Dow has been kept going for so much longer. The credit crash continues unabated. Mainstream news claims that "the worst s over" are based mainly on the observation that the Fed's 50 basis-point emergency rate cut in September has resulted in a slowing of the decay and increase in commercial paper transactions. Predictably, that analysis - if it deserves that term - stops about a few inches short from penetrating the surface of it all. Have you ever gone to your bank to apply for a loan and were turned down because your income to debt ration wasn't high enough, or because your credit rating was zapped by some slow payments? Well, a funny thing is now happening: Banks themselves are running into the same problems. The reason? Too much creativity. Uhh, I meant: too much creative accounting. When banks figured out they could push risky assets off their balance sheets by selling them to risk-hungry investors (higher risk equals higher returns in these idiots' minds), they never thought their practice would catch up with them. Banks are beginning to regard each other suspiciously, ironically by virtue of their own shady practices,knowing that, if they do it, they can't be trusted and so other banks who are most likely doing it as well can't be trusted either. This is a particularly tricky situation because, for a bank not to trust another bank, it must know the very foundation of the other bank’s business is shoddy. Banks don’t go running to the nearest credit bureau to find out if the one seeking a loan has some slow payments on its record. Banks deal with each other on the basis of balance sheets and audits. The tricky thing in this subprime mortgage-induced credit crunch is that, due to the slick operation of “repackaging” loans originated by the bank and then selling them to investors or offloading them to separate entities called “conduits” or “SIVs”, balance sheets don’t tell the true story any longer. In many cases, the offloaded loans were sold to outfits that maintain a “credit line” with the originating bank. That credit line, as long as it is not used, doesn’t show up as a liability on the bank’s balance sheet. It is merely a contingent liability. There is no way of telling for how much an originating bank can be held up, so to speak, by the buyer of the loan packages if the buyer calls on his credit line. There is also no way of telling whether the added credit will lead to improvement of the buyer’s situation or whether the buyer will go under. If it goes under, the originating bank ends up being out of large sums of money with little or no recourse. The long and short of it is that banks know other banks are “dirty” because they, themselves, have used the same techniques and are therefore intimately familiar with the trickery and deceit that is going on. While things are looking up and the real estate lending market was growing and new borrowers were still paying their mortgages, nobody paid attention. But once the defaults started to come in, the picture changed. Dramatically! In the final analysis, the question is: when banks, who are intimately familiar with how their counterparts work don’t trust their counterparts anymore, how can depositors who know nothing of how banks operate trust them - any more? Because debt is the foundation, the very nature of the entire world financial system, people’s and institutions’ willingness and ability to make payments on that debt is crucial for the system’s continued existence.. When that is cast into doubt, what will hold the structure up? When con artists lose their victims’ confidence, they either have to resort to applying brute force to their victims - or they have to stop operating. Which one is it going to be for the banks? The banks who are hardest hit by these credit woes and who had to write down their profits on account of credit-shenanigan losses are our good old friends, the bullion banks - the main agitators behind the late 1990s - early 2000s gold manipulation schemes. Meanwhile the IMF has announced that it is cutting back on its growth forecasts for the US and Europe, mainly as a result of the credit crunch, all the while using semantics to make it sound not all that bad by stating that the US subprime lending crisis "could" broaden into a world-wide credit crunch - as if it wasn't already happening. Countries around the world are being impacted by this mess, particularly Germany, the UK, and Russia. The developed countries growth is expected to get slashed to such a degree that China - for the first time ever - will likely become the largest contributor to world economic growth! Naturally, all of that makes the G7 ministers kind of itchy under their bellies, and so they turn on countries who are trying to keep their domestic wealth positions somewhat insulated from this subslime crisis. These countries, mainly those of Asia's eastern seaboard, have been busy setting up what are known as "sovereign wealth funds". The G7 (meaning mainly the Western financial powers) now want to regulate them. Ha! We all know that the globalists don't like for us individuals to do with our money as we please without asking them for permission or at least 'reporting' to them what we do. Now, they want to extend that questionable courtesy to sovereign nations, as well. WE PLEDGE ALLEGIANCE TO THE FLAG OF THE UNITED NATIONS, AND TO THE BANKING SYSTEM FOR WHICH IT STANDS. ONE WORLD, UNDER TOTAL SURVEILLANCE, WITH LIBERTY AND JUSTICE FOR ONLY A FEW. Instructions: Stand at attention, face the direction of New York city, the Mecca of the world elites, and with your right arm outstretched in a "Hitler-Gruss" fashion, recite the words quoted above with a loud and solemn voice. After a full spring and summer of ominous signs that the Bush/Cheney consortium is planning an attack on Iran, it suddenly feels like the worst has been and could be avoided. Secretary of Defense Gates came out with an announcement today tat Iran has promised to stop illegal weapons flows into Iraq (while officially denying that such ever took place in the first place). Gates made noises that he doesn't believe the Iranians and is adopting a wait and see attitude, but the mere fact that the US Defense Secretary is making such announcements to the press must be seen as significant. Whether this represents a true change of atmosphere in the middle east or whether it is a calculated attempt by the administration to make critical members of Congress and the public relax a bit and stop being to darn watchful truly remains to be seen. Personally, being ever the optimist, I feel like the weight has come off just a bit. An all-out US assault may indeed be averted for now. 7. A Ron Paul Presidency? My great hope is that nothing happens before the 2008 election and the passing of the presidential baton in 2009. Why? Because I do believe that Ron Paul has a chance to win. (As he said on the Jay Leno Show: "There is actually a risk I might win.") Told you that I'm an incorrigible optimist, right? Honestly, there is nothing better that can happen to this country and the world than a Paul presidency. A whole host of evil developments would be cut off at their root - and that root is money and the control of it by the Barons of Debt. Of course, the Barons' aims do not include 'more money'. They have all the money in the world and the ability to create more at will. But, in order to achieve their goals, money plays an intricate part in their schemes. The politicians and judges and world leaders they control with their money-issuing/credit-granting power do not have "enough" money, yet. Those guys want more. They have two main sources of money: Their blank check with the federal reserve system, and lobbyists. If Ron Paul succeeds in eliminating both the federal reserve and the IRS along with all income and capital gains taxes (at least those on gold and silver bullion transactions), no lobbyist in his right mind would find it worthwhile to by a plane ticket to Washington anymore. Wielding his veto pen while working with Congress to eliminate the income tax and passing a repeal of the 16th Amendment, Ron Paul can stymie every attempt of Congress to pass a pork-barrel spending bill. Congress would be so busy trying to garner a super-majority to override his rapid-fire veto salvos that it won't have much time for anything else. Once the income tax and the 16th Amendment are repealed, and the federal reserve is disbanded, there simply won't be enough money coming to Washington DC for the politicians to try and dole out through their spending bills - despite their best intentions. The effect will be most salutary to the country's economic and political health. The money will stay with the people in the several states. Lobbyists may then descend upon our 51 state capitols in order to try and get what they want - but due to the dispersal principle there will be much less to gain, and whatever they can gain will extend in its reach no further than the borders of each state they are active in. Talk about reducing corruption on a major scale! If one state succumbs to their influence and passes a heavy income tax, those who like their freedom can move to another state where the government is not as corrupt - so the potential for evil is tremendously reduced. Without a capital gains tax on precious metals transactions, gold and silver can freely fulfill their monetary functions again because there will no longer be anything that keeps them from freely circulating in the economy. They will act as an alternative currency to the fiat system. When that happens, we will see how much a federal reserve note that calls itself a "dollar" is really worth. It will be a true free-market currency. Not government involvement in its issuance is required. Gold already exists, and government didn't create it. Congress can, if it insists, continue to issue paper money. It would have to be called something other than "federal reserve note", though, because the Fed will no longer exist. With physical and online gold and silver freely competing against fiat, Congress will naturally have to come up with some kind of a "backing" if it wants its currency to be able to compete with gold grams and silver grams. Guess what that backing would have to look like? You guessed it. The only thing Congress can do would be to promise full redeemability of whatever paper currency it issues, or people will simply stick to gold and silver. And, for once, Congress will have to keep that promise indefinitely because now there will be a viable alternative over which it has no influence. Naturally, the next president could try and reverse all of those changes if Ron Pal succeeds in making them in the first place - but by then the American public will be of an entirely different mind set than it is now. It is already astonishing to me, who has written about these subjects for years, how many Americans are already fully aware of the principles that under-gird a free society, including economic ones. I actually organized the first Ron Paul Meetup group ever in early April this year. By now, there are over 62,000 members in over 1,000 groups in 870 cities and 21 countries around the world. Yes, I said "countries." From personal experience, I would estimate that at least half of these are under the age of 30. He was already on Leno. He will soon be on Oprah. With his endearing charm, personal warmth, no-nonsense straightforwardness, and relaxed sense of humor (even a reporter who calls him a "crank" felt compelled to note that he is "totally charming," recently) his audience will grow in leaps and bounds. So will his poll numbers. By the time the primaries come around he will, despite substantial improvements in his poll numbers, still be 'far behind' - and then the GOP (and the Democrat) party establishments will be shocked to see that he wins most of the early primary states and even big ones like Texas and California. Because his support doesn't register in the polls. Polls re conducted on land phone lines. Most people under thirty don;t even pick up their land lines if they have them at all. He (I should say his message) energizes a segment of the population that has never been known to participate in the political process. Now,they do - and with a vengeance! So, if you snicker behind your hand as you read this, be ready. It absolutely can happen - and I believe it will. And, when it does happen, your wealth will be secure. In a few years, you won't even wonder anymore what the "dollar price" of your gold and silver is. It will be largely irrelevant. You will go shopping for groceries with silver grams, and for cars and homes with gold grams. Even if Ron doesn't win, his following will be so widespread that it will be near impossible for the globalists to still push their plans through the way they thought they could - at least here in this country. And, if this country changes course, people in other countries will wake up too, point to America, and say to their leaders: That's what we want! It will be a different world.